When we were teenagers and still living in the same house, my younger sister Darla would surprise me by bringing me a fresh mug of homemade hot chocolate when I was working on projects. It was the sweetest thing! I’ve always loved hot chocolate but those memories have made the cozy drink even sweeter. I haven’t had much hot chocolate since being vegan; any time I’ve looked for hot chocolate mix at the grocery store milk was always an ingredient. Whomp whomp. Because of this, I thought DIY vegan cocoa mix would make a wonderful holiday gift--vegan recipient or not! I love the idea of giving a full jar of cocoa mix for three main reasons; one: you’re giving more than just a serving or two of hot chocolate, two: they can refill the jar with more hot chocolate mix or simply reuse the jar when they’re done, and three: I love homemade jar gifts! 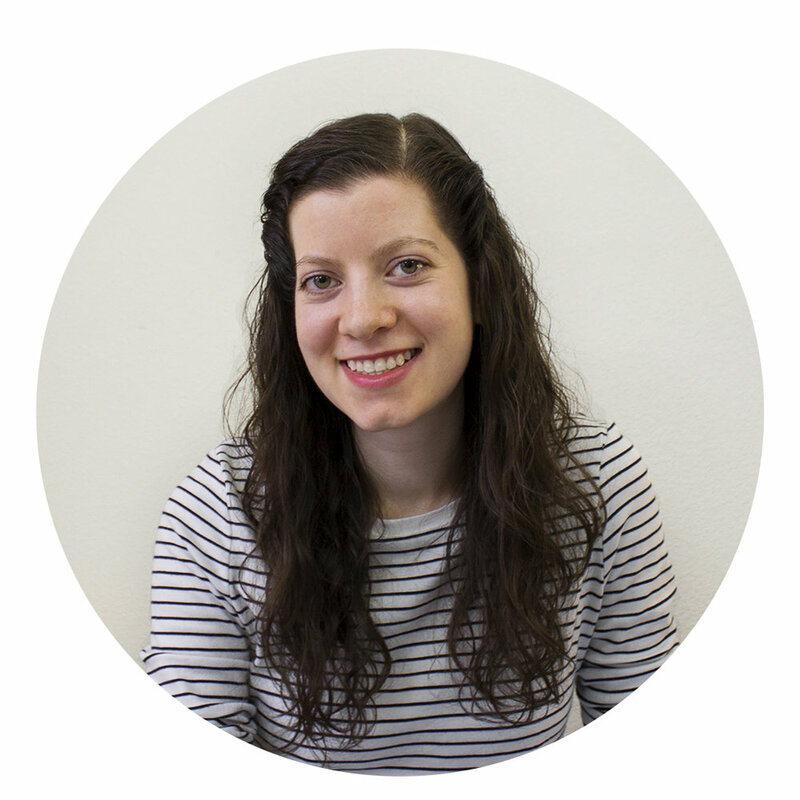 Just look at that cute ruffled fabric on top! My goodness! I’m pretty sure I’ll be making more ruffled-fabric-jar-gifts in the future! This would be a fun winter gift to make with kids for your neighbors, friends, family members, and especially any vegans on your list! It would also make a great hostess gift for any holiday parties you attend! I’m using the pint-sized Ball jars that I bought in a pack of 12 at my local craft store for about $13. You can also find them on Amazon. What’s nice about making all 12 jars into the vegan cocoa mix is you can either make them for specific people on your list or keep them at hand so if there are any unexpected gift exchanges or last minute party invites you’ll have a lovely homemade jar of vegan cocoa mix at the ready! Cocoa, in my opinion, should be very chocolatey. As such, I wanted to add real chocolate to the mix to give it some extra richness. I also feel like holiday hot chocolate isn’t complete without a candy cane in it so I’ve added candy cane dust to the mix. If candy canes aren’t your jam, feel free to leave them out of use something else in their place like another type of candy. I’ve included two printable labels, one says what the gift is and the other one has the directions and refill recipe on it. I printed mine out on white cardstock and left them side by side if you’d like you could glue or tape them together and make one singular tag with a front and back. Click the link below to download my labels. I do ask if you download my printout, please keep it for personal use only. Start by setting up a double boiler. I’m using my usual setup that consists of a little metal pot with a metal bowl placed inside. The bowl doesn't fit inside all the way or touch the bottom of the pot. Prepare a container to pour your melted chocolate into. You want it to harden into a shape that will be easy to grate. I lined my container with wax paper to ensure it wouldn’t stick. Melt your (vegan) chocolate chips down. Don’t add anything to your melted chocolate, you want it to be solid chocolate so it grates easily. Once melted, pour your chocolate into your prepared container. Place in the fridge to harden. I let mine harden overnight. Once your chocolate is fully hardened separate it from the wax paper and start grating it using the largest hole side of your grater. You might want to run your hands under cold water or use an ice pack to cool your hands so the chocolate doesn't melt as easily during grating. Unwrap your candy canes. Place them into a blender, food processor, or Nutribullet and grind them up into a powder. If you don’t have an appliance to do this you could freeze your candy canes to make them more brittle. Then crush them up using a plastic bag covered in a hand towel and a rolling pin. Once you have enough candy cane dust and grated chocolate, take a large bowl and start adding in the ingredients to it. Mixing well with a whisk. 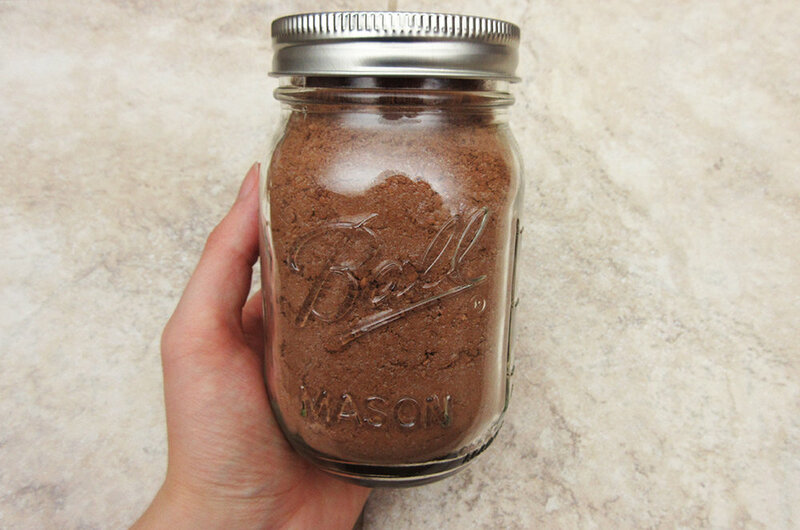 Spoon your hot chocolate into your pint-sized jars and seal them up! From here you can decorate your jars however you choose. In the photos below I show you how I decorated mine. A whole 12oz bag of chocolate chips made enough grated chocolate for 3 batches of cocoa with some grated chocolate leftover. Prepare a container to pour your melted chocolate. 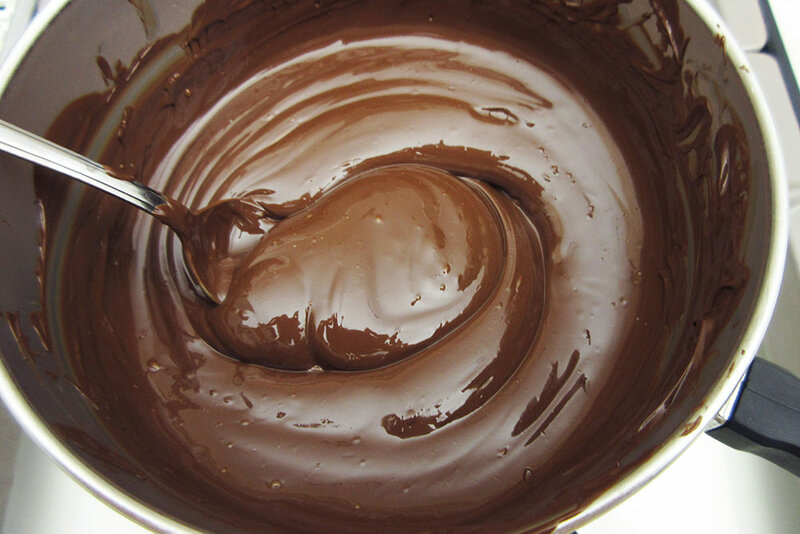 Next, pour your chocolate into your double boiler and over low heat melt your chocolate. Once your chocolate is fully melted, pour it into your prepared container. Place the container in the fridge to let the chocolate harden. While your chocolate is setting up in the fridge, begin to prepare your candy cane dust by breaking unwrapped candy canes into smaller segments, as shown above. Place your candy cane segments into a Nutribullet, food processor, or blender and blend until you have candy cane dust. This is what your blended candy canes should look like. If you don’t have a blending appliance you could use crushed candy canes instead. They just won’t melt as quickly. Once your chocolate is fully hardened it’s time to grate it! For my batches of cocoa I used the large side of the grater. Now you’re ready to start mixing up your cocoa mix! Simply add in all of the ingredients before whisking to combine. Now it’s fully whisked and ready to be put into your jars! See how easy it is? Here's the cocoa in my pint-sized Ball jar ready to be decorated for gifting! To decorate my jars I wanted to go the traditional route and put some festive fabric on top. My mom and I found this red and white polka-dot fabric at our local craft store. As soon as she showed it to me I was in love! 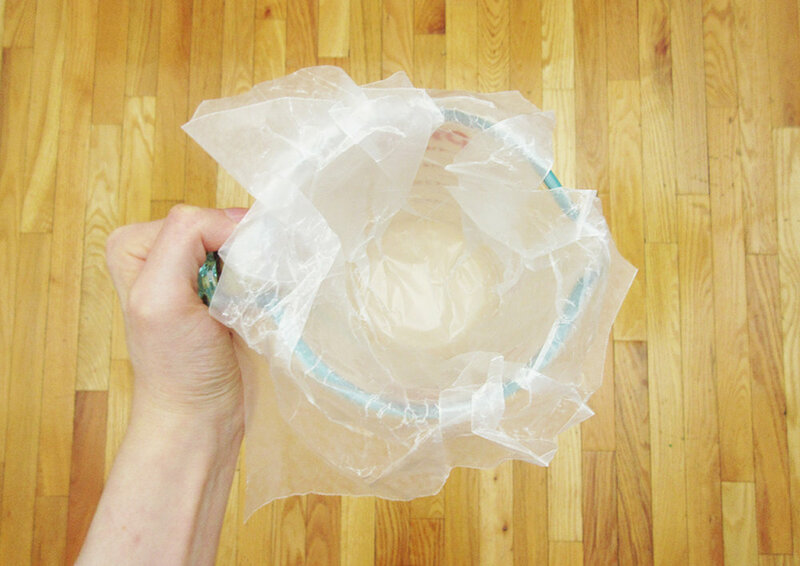 Once you have your fabric, find a plate, bowl, cup, or any other large circle you can trace, to trace a large enough circle to drape over your jar. It doesn't look like it but I have my fabric with the ‘pretty’ side facing down. To draw my line I’m using a fabric pen that will fade after a few hours, you could also use bar soap, a pencil, or chalk. Now just cut out your fabric circle! To secure your fabric to your jar you’re going to need string, yarn, or twine. I’m using some hemp twine I found at my local craft store. I wanted to secure my fabric to the top as easily as possible because it was somewhat fiddly trying to simply tie the fabric on top. I took my twine and made a large slipknot, as shown. When your fabric circle is centered on your jar, slide your slipknot over the fabric and jar. Pull your slipknot tight and adjust your fabric ruffle by pinching the fabric where you want more bunches/ruffle to be. Wonderful! The fabric is secure and bunched beautifully! Next, if you’re going to add my labels print them out on cardstock and cut them out. I used a small hole punch for the hole but if you don’t have one you can try and use scissors, a skewer, or the like. Feel free to tape them together to make one label or hang them on top of each other like I did. Now take another segment of your yarn, string, or twine; thread the labels onto it and tie a bow around your jar. Holey moley! If that isn’t totally gift-worthy I don’t know what is! Feel free to decorate your jars however you see fit and most importantly: have fun with it! Are you giving handmade gifts this year? I'd love to hear! It's so fun to mix gift giving and crafting! I hope you guys have a great weekend and get a chance to make yourself a pint of vegan candy cane cocoa! It's just so darn tasty!